DON’T BLINK: KOIOS UP OVER 120% COMBINED! 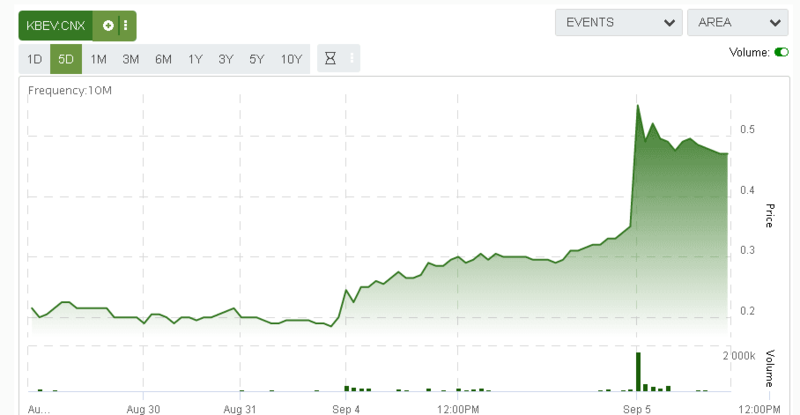 KOIOS Beverage Corp (CSE: KBEV & US: KBEVF) is, once again, the best-performing stock in North America! Put together, it is up a whopping 150% in less than two trading days, since we alerted that it is the most undervalued Millennials company in the world at CAD$0.20. The stock price is now much more reflective of the underlying business, the strength of the brand, and its future prospects. Cannabis is, once and for all, going to be fully legalized, carefully regulated, and properly studied and grown. Many will enjoy its unique properties, including clients of KOIOS Beverage Corp., which will also benefit from memory performance, enhanced attention span, and greater focus. I couldn’t be more thrilled and excited about this successful trade, and our analysts enjoy receiving your countless incoming emails about this stock. I am already evaluating another tiny company, which I have no doubt could become our next huge winner! This work is based on SEC filings, current events, interviews, corporate press releases and what we’ve learned as financial journalists. It may contain errors and you shouldn’t make any investment decision based solely on what you read here. It’s your money and your responsibility. Never base any decision off of our emails. wealthresearchgroup stock profiles are intended to be stock ideas, not recommendations. The ideas we present are high risk and you can lose your entire investment, we are not stock pickers, market timers, investment advisers, and you should not base any investment decision off our website, emails, videos, or anything we publish. Please do your own research before investing. It is crucial that you at least look at current SEC filings and read the latest press releases. Information contained in this profile was extracted from current documents filed with the SEC, the company web site and other publicly available sources deemed reliable. Never base any investment decision from information contained in our website or emails or any or our publications. Our report is not intended to be, nor should it be construed as an offer to buy or sell, or a solicitation of an offer to buy or sell securities, or as a recommendation to purchase anything. This publication may provide the addresses or contain hyperlinks to websites; we disclaim any responsibility for the content of any such other websites. We have entered into an agreement for three hundred thousand dollars and five hundred thousand options paid for directly by the company. We have also purchased shares and are long the company. Please use our site as a place to get ideas. Never make an investment decision off of anything we say. Information contained in this profile was extracted from current documents filed with the SEC, the company web site and other publicly available sources deemed reliable. The information herein is not intended to be personal legal or investment advice and may not be appropriate or applicable for all readers. If personal advice is needed, the services of a qualified legal, investment or tax professional should be sought. TRADE Locked: BUYING This Stock AGGRESSIVELY!